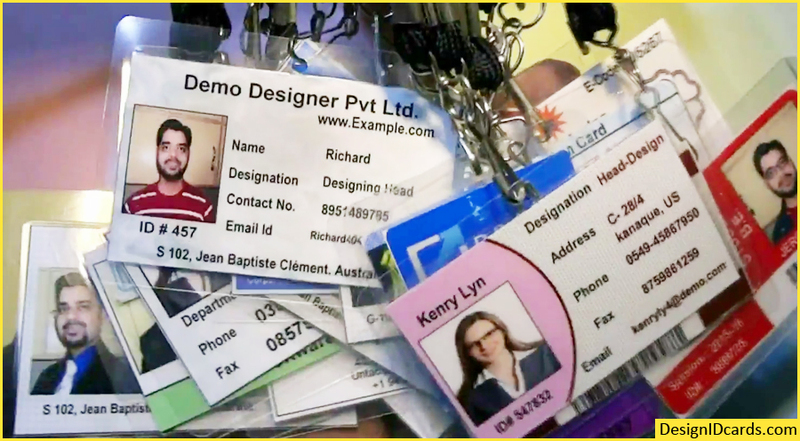 ID Card Designing Software helps you to generate professional looking identity card such as Personal ID card, Visitor ID card, Student ID card, Employee ID card and other types of ID card. 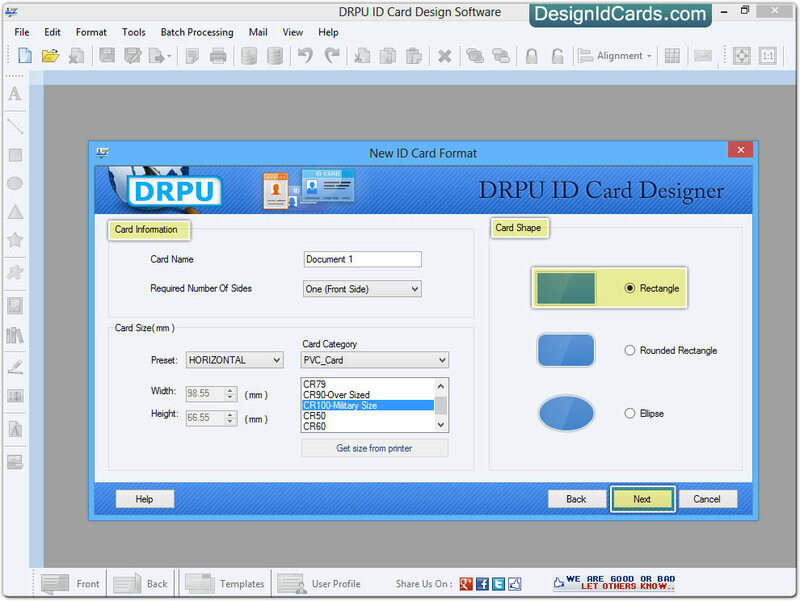 Software provides different types of card designing objects to design customize identification card in your style. 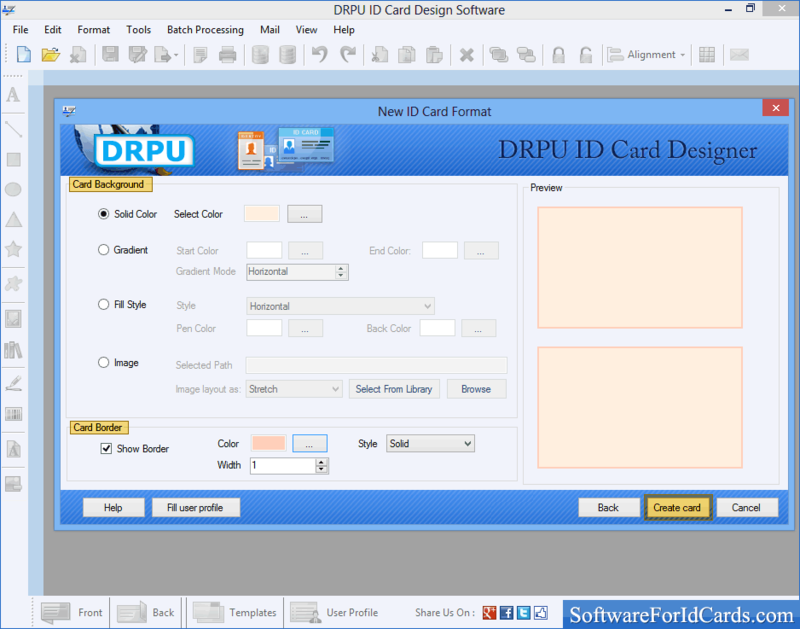 Identity card maker application starts designing ID card using predefined templates available in the software, using wizard or with blank format. Software also provides facility to edit the existing identity card format. 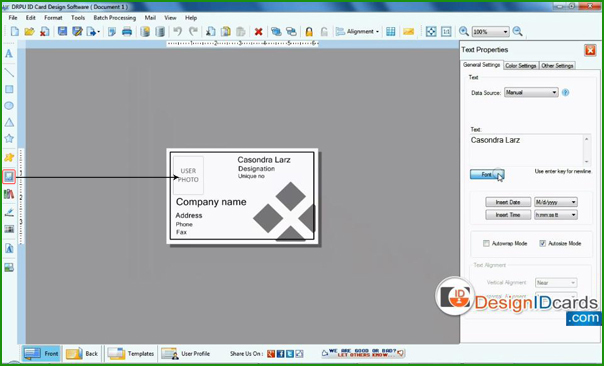 Identity card creator utility enables you to import the data saved in excel file format. 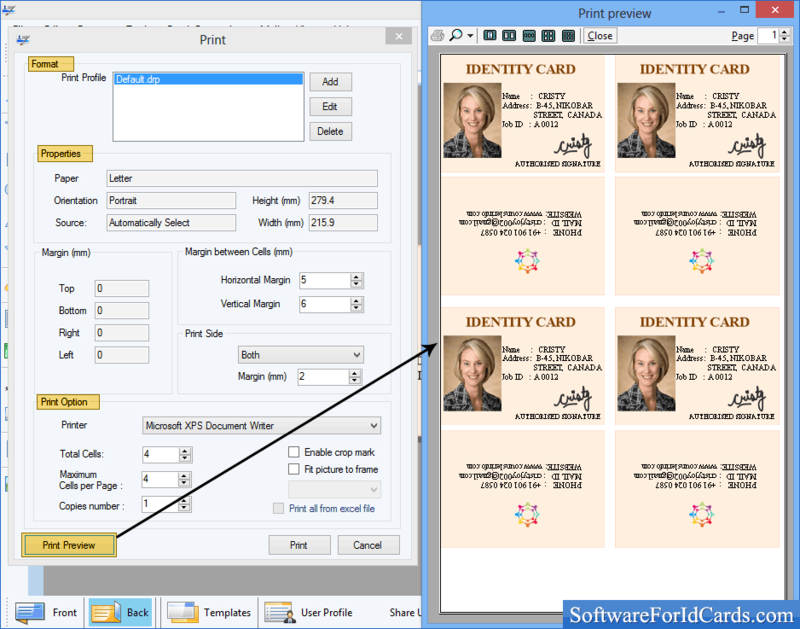 Identification card designer software creates log file to save designed ID card so that it can be use later. 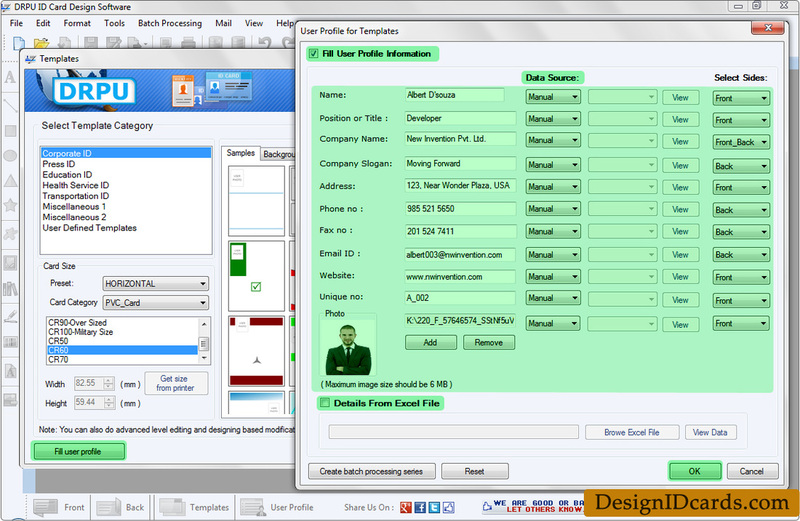 Software has inbuilt advance color settings to generate colorful identification card. 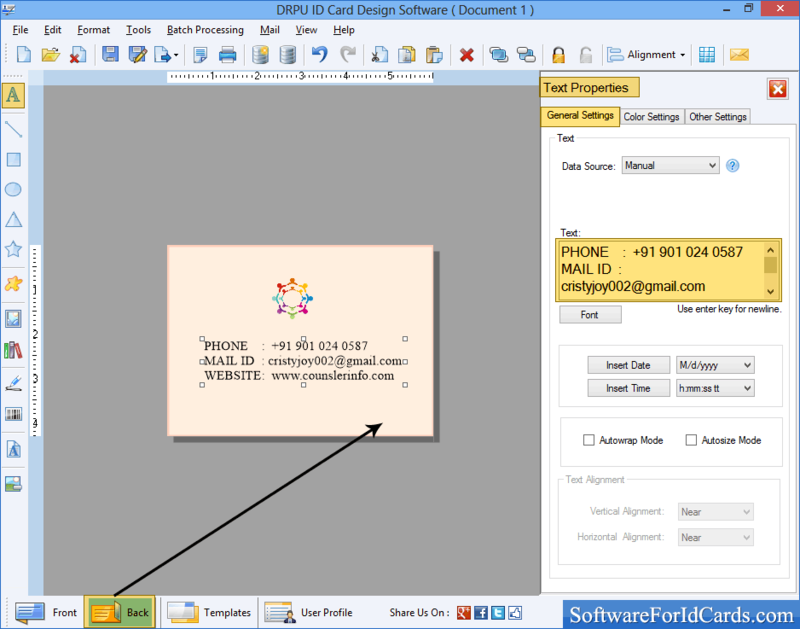 User can add text messages from message template to ID card during identity card designing procedure. Inbuilt email feature allows you to send generated identity card to single or multiple email ID’s. Software provides advance ID card designing tools such as Text, Pencil, line, Triangle, Symbol, Watermarks, Arc, Picture, Signature etc. 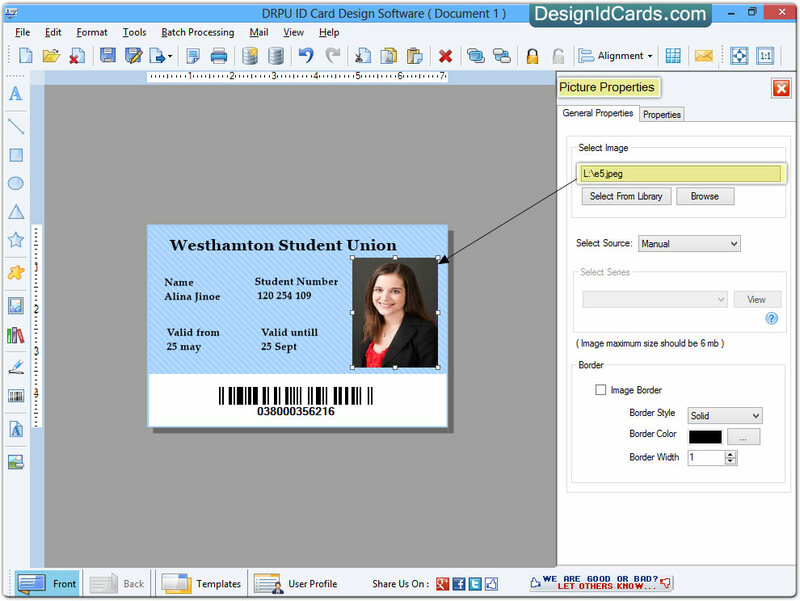 Software provides option to select the images from library while designing ID card. You can print designed ID card using advance printing settings. Application provides option to create ID card in various shapes like ellipse, rectangle and round rectangle. Batch processing series features helps you to generate multiple identity card with different barcode and text values. User can export generated identification cards in various file format like PNG, JPEG, BMP, PDF etc. 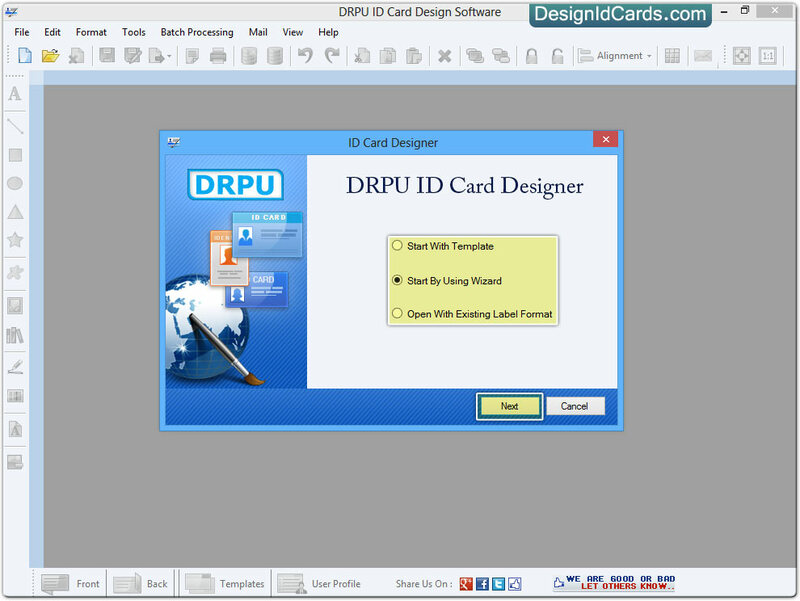 Step 1: Install ID Card Designing Software in your computer or laptop. Step 2: Start ID Card Designing Software and select option to design identity card including “Start With Template”, “Start By Using Wizard” and “Open With Existing Label Format”. For demonstration purpose, we have selected “Start By Using Wizard” option to create ID card. 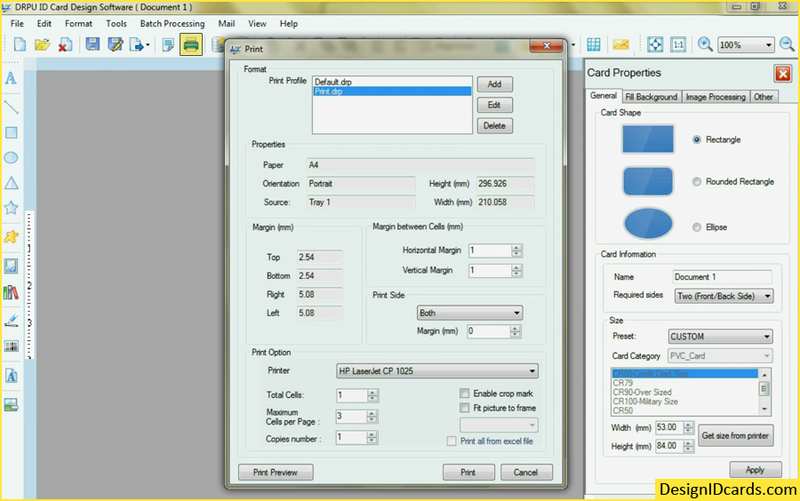 Step 3: Fill the card information, set the card size and select card shape according to your requirement. Click on “Next” button for continue process. Step 4: Fill the color of card background and set the card border as shown. Click on “Create Card” option for creating identity card. Step 5: Go to front side of your card and browse the photograph from PC to insert in your ID card. Click on “Open” button. Step 6: Insert text in your ID card and adjust the general settings of text according to requirement. ​Step 7: If you want to insert signature in your ID card. Click on “Signature” option and draw the signature as shown in the figure. Click on “Ok” button. 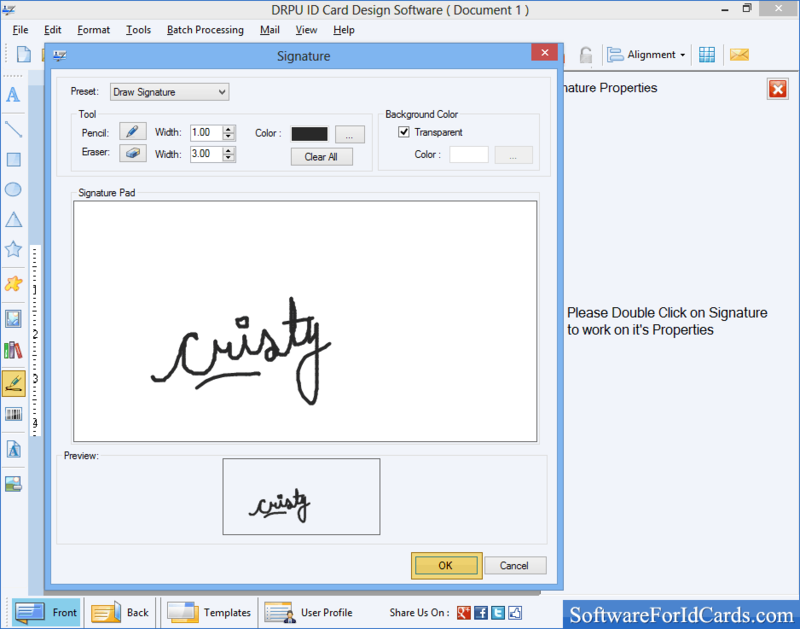 You can also browse the signature image from your PC to insert in your identity card. Step 8: Now go to the back side of the card. Insert text and set the general the general settings of text as shown. Step 9: Press ‘Print’ button and adjust the printing settings according to your need. 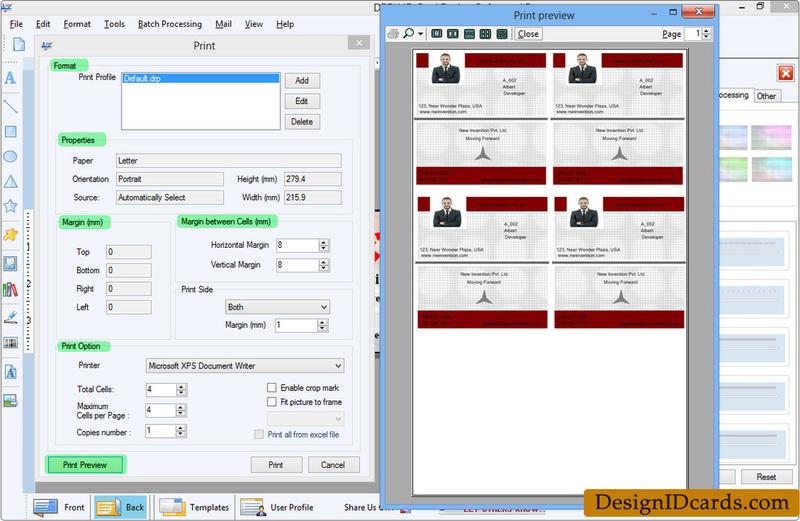 Click on option “Print Preview” to view designed ID card before printing process. Step 10: Now trim the printed identity card according to card dimension using hand paper cutter, paper cutter or scissor. 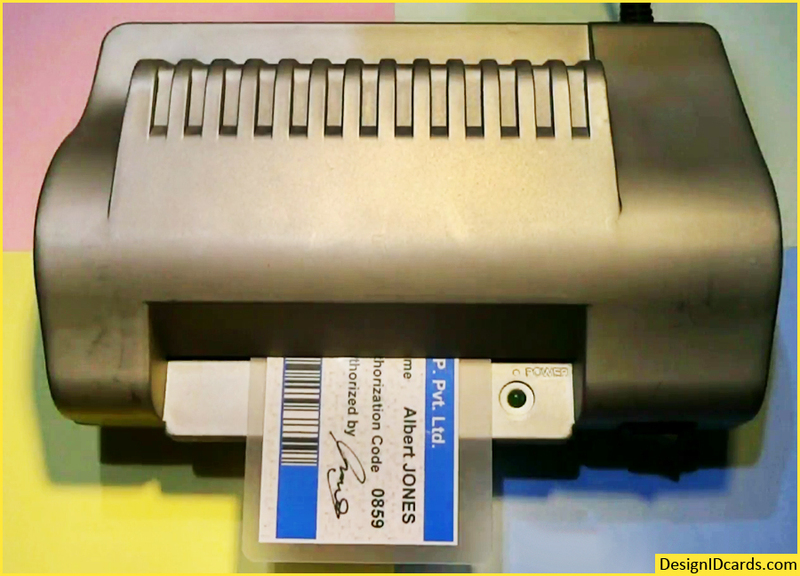 Put the ID card in lamination pouch for laminating using lamination machine. Punch hole in ID card using punching machine. Now your identity card is ready to use. ID Card Design Software provides facility to create identity cards in different shape, size and color as per your need. 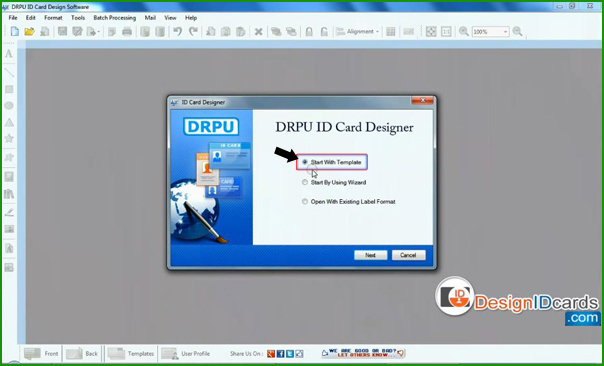 ID card maker utility provides facility to create ID card using advance designing objects like rectangle, line, text, pencil, picture, arc, barcode, ellipse, star etc. 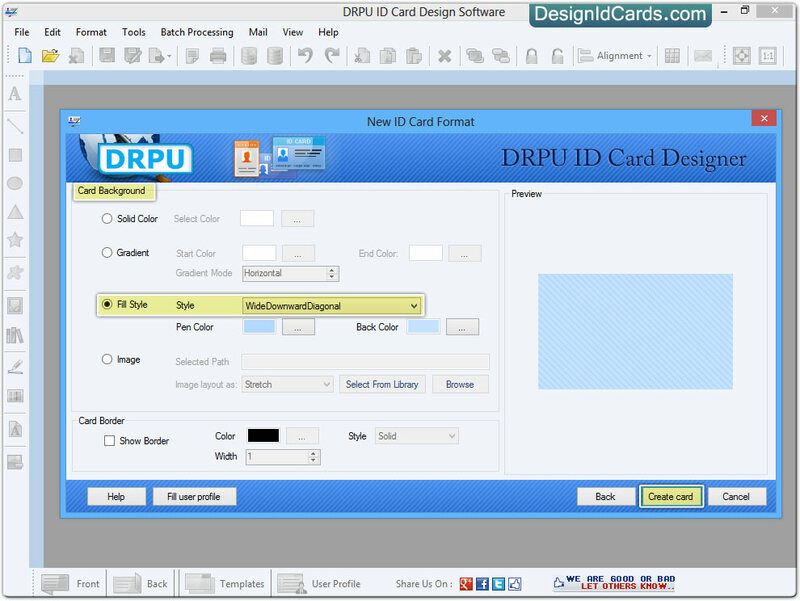 ID card designing utility provides facility to create new format ID card or edit existing ID card format. 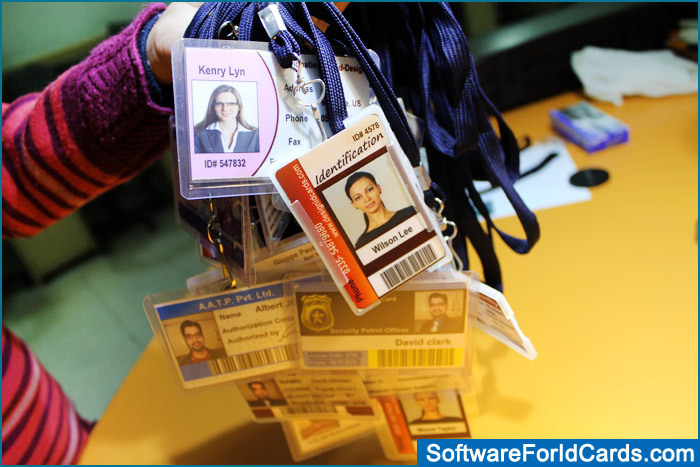 Software is useful for design different type of ID cards like Visitor ID card, Student ID card, Employee ID card, Faculty ID card, Security ID card, Government ID card etc. 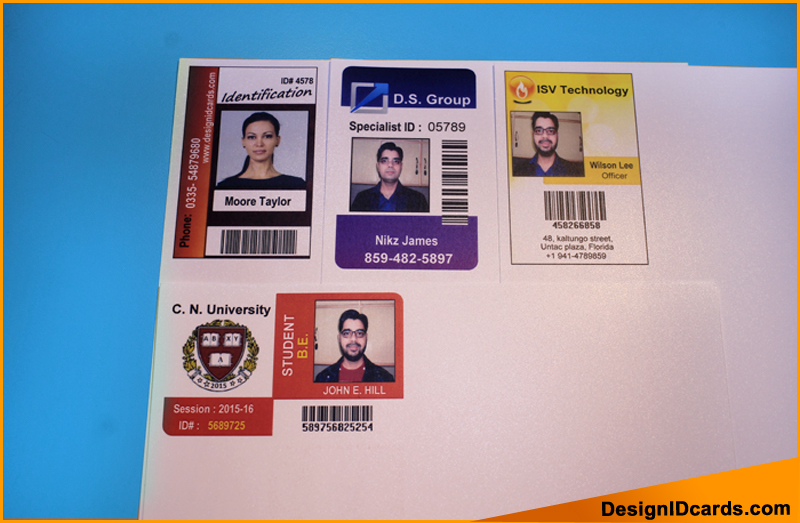 Software provides option to design ID cards in different shapes like rounded rectangle, ellipse and rectangle. ID card creator application provides facility to create ID card with specific type of fold like quarter fold, half fold and other type of fold. 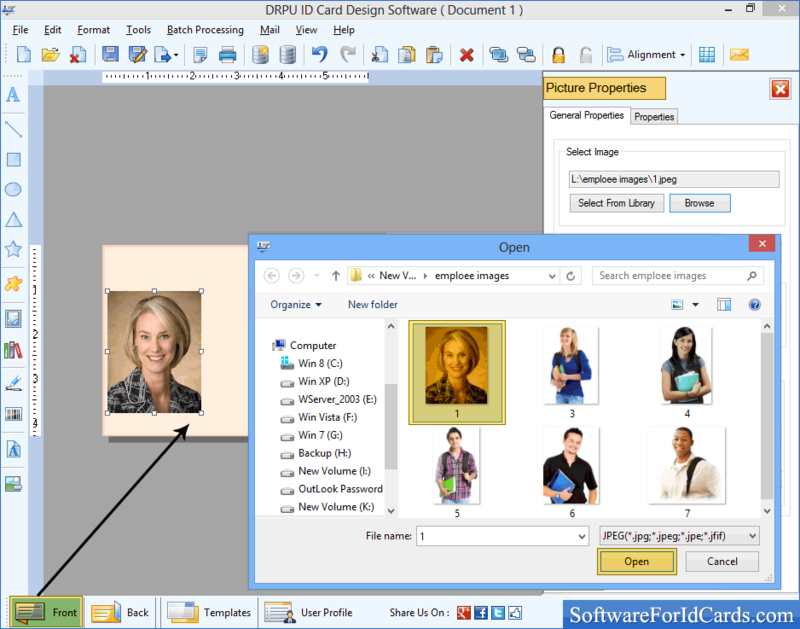 ID card maker software provides facility to create ID cards using advance image designing tools like text, line, Barcode, Pencil, picture, rectangle, ellipse etc. 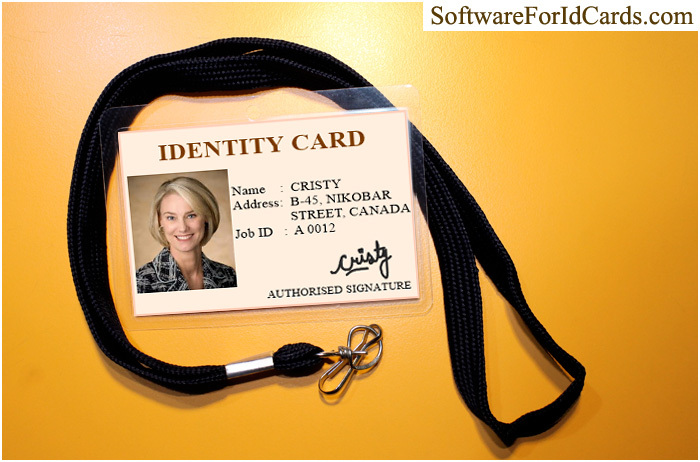 Software provides facility to design new format ID card or edit existing ID card format. Software provides facility to save created ID cards for future usage or re-modification. 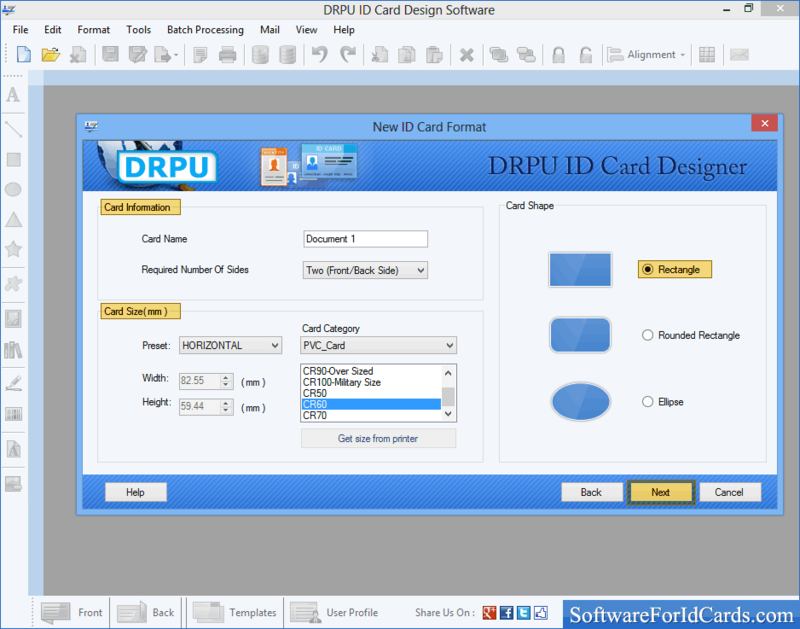 ID card creator utility provides advance facility to design ID cards in different shape like rectangle, ellipse and rounded rectangle. 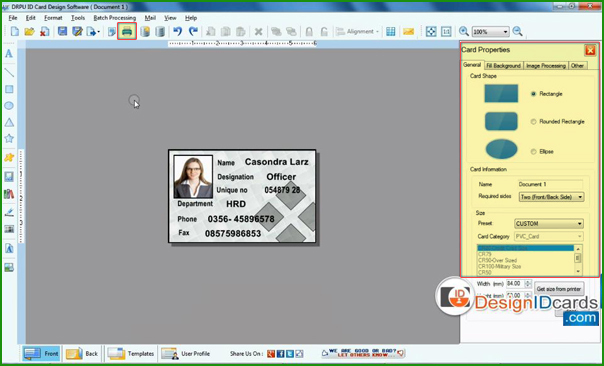 Software provides facility to create ID card with wizard or with Blank format. Identity card maker application provides option to create ID card with specific type of fold like Quarter Fold, Half Fold and other type of fold. 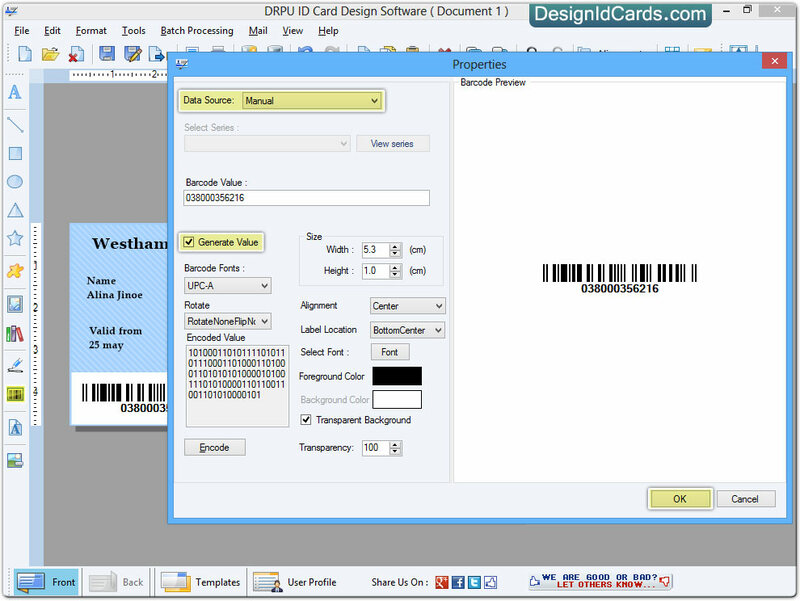 ID card creator application allows you to generate multiple copies of ID cards with different barcode and text value. 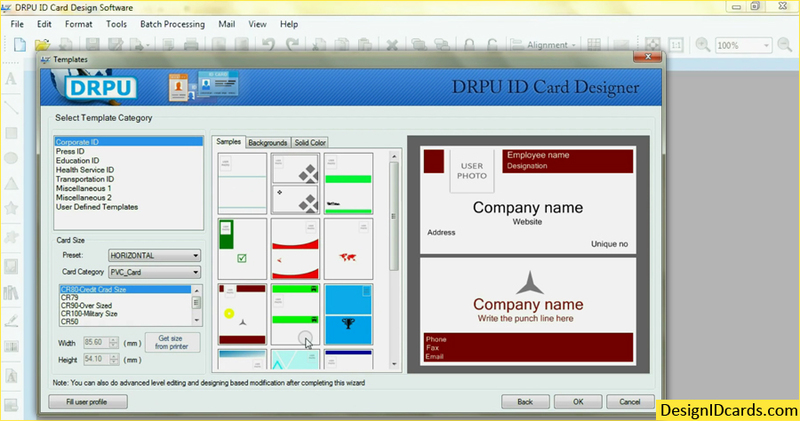 Run the ID card Design Software on your PC. Choose any one option among ‘Start with Template’ ‘Start By using Wizard’ or ‘open with existing label format’. Here we are using ‘Start by Using Wizard’ option to create ID card. Specify the card information, card shape and size as per your need and click on ‘Next’ button to continue the process. Now set Card Background color and style and click on ‘create card’ option. 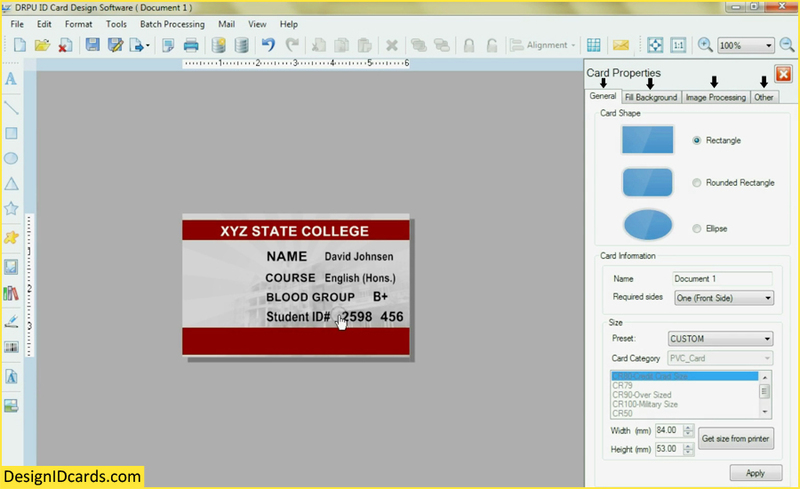 Add or Modify text on your ID card by using Text Properties feature. Select the path of image which you want to add to your ID card by using Picture Properties option. Add Barcode by using Barcode Properties option by entering Barcode value. Choose barcode font and other settings. An identity card is a document that is used to verify the personal details of user. In present time it has become necessary to wear ID card, if you are company employee, student or faculty. Companies provide ID cards to its employees for security and verification purposes, so that any unknown person could not enter into your enterprises. Identity card consists of various attributes like card holder name, age, designation, birth date, address, religion, phone etc in some specified format. In many countries government issues compulsory identity cards in order to avoid mismatching, fraud and impersonation etc. Id cards are also useful in document verification and many other places to show your unique identity. 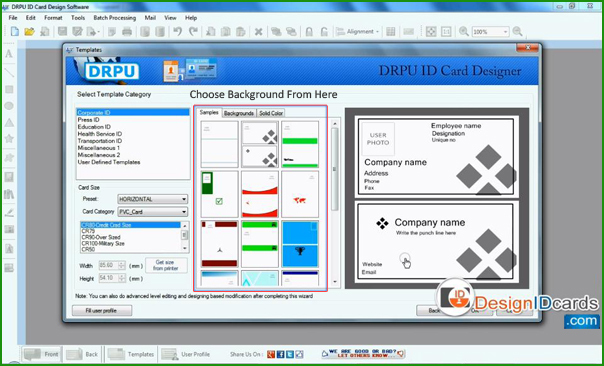 Users can easily generate bulk standard-sized cards for their staff members in minimum time by using ID card maker software. This program lets users to create and print identification cards on PC as per your requirement. 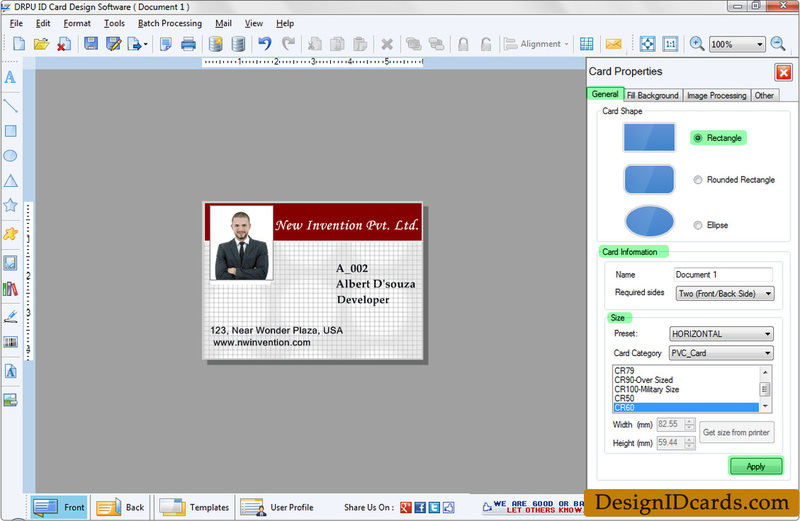 Here we are going to generate ID cards by using Start with template option. Step-2- A predefined stock of template is available for users. Select template category and choose template as per your industry need. Select card size, card category, width height, and background. Step-3- In this step fill user profile on template. There is facility available for users to either enter user details manually or using excel sheet. Check on “Fill User Profile Information” option if you want to enter details manually. Step-5- For printing ID cards, click on print icon and adjust settings as per your need. You can also print multiple copies of same ID card. ID card is a brief document in standard-sized card shape that is used to verify the aspects of a person’s personal identity. It may contain many attributes as bearer’s full name, address, age, designation, DOB etc in some specified format. Identity cards are necessary for all users for verification and authentication purpose. Most of the organizations provide ID card for its employees that give them unique identification. 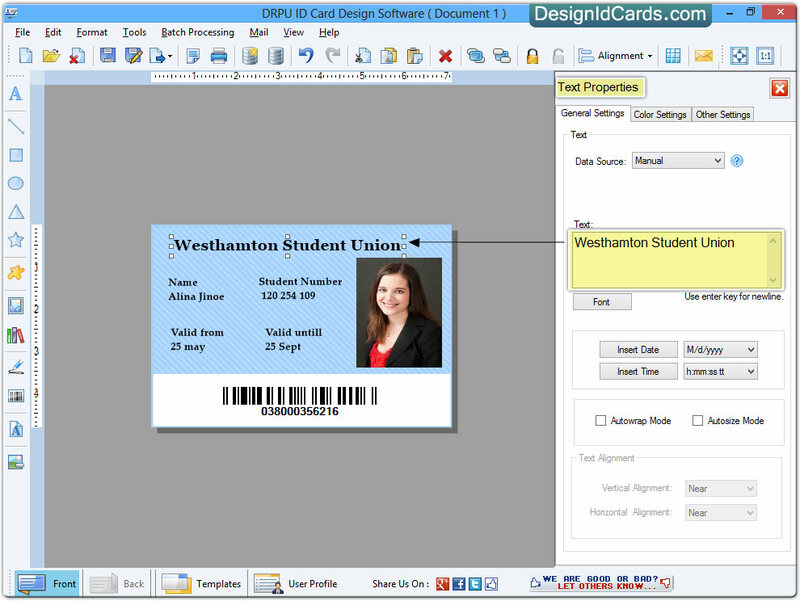 Users can easily create and print identification cards for students, employees, faculty and visitors using ID card designer software. ID card maker tool enable users to generate and print wide variety of ID cards on PC just in minimum time and efforts required. This application lets users to create more than one ID card using advance data set series feature with different text and barcode value. 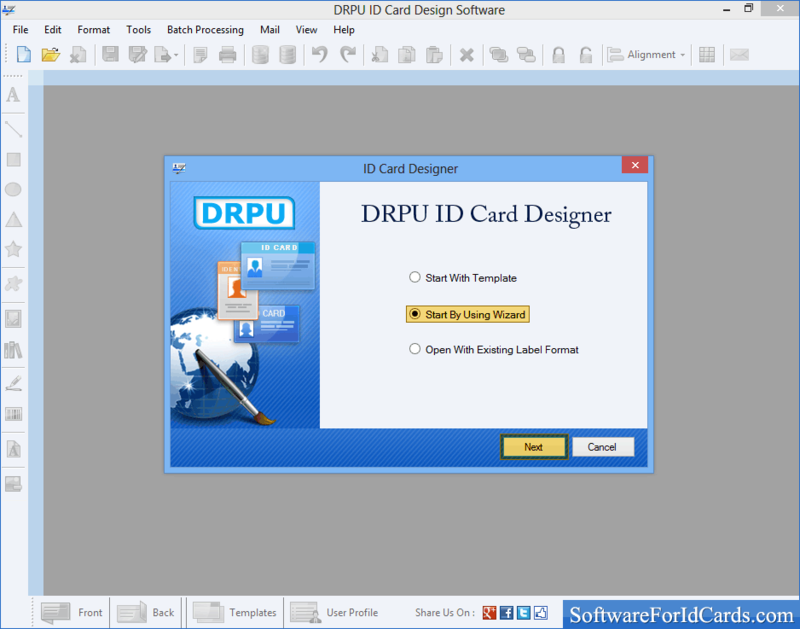 ID card generator utility supports various card designing objects as pencil, color, text, rectangle, ellipse, oval etc to design ready to use identification cards in distinct shapes. 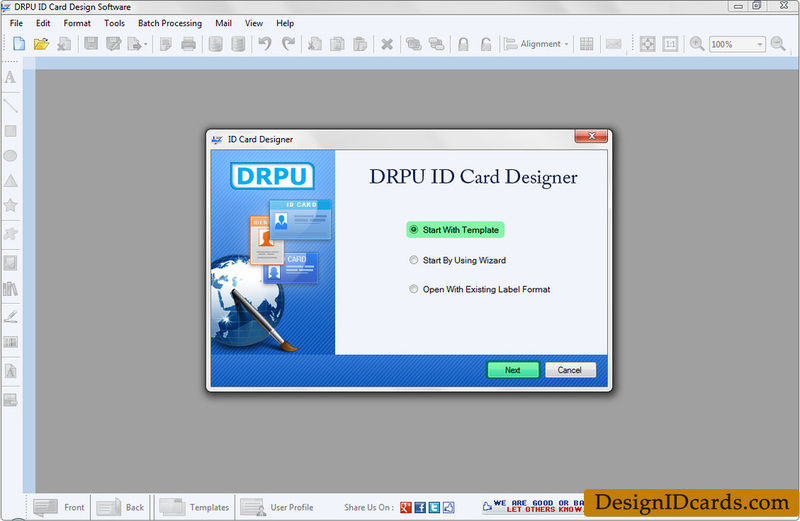 Step-1- Firstly install and run DRPU ID card designer software on PC and select start with using template. Select template from pre defined stock. Step-2- Enter user details. Users can adjust card properties as per their need. 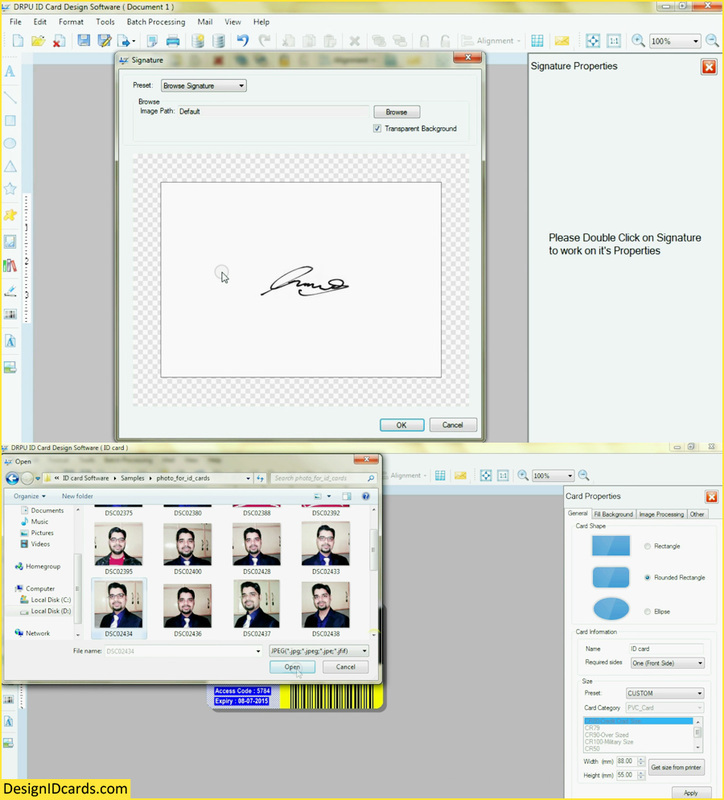 Step-3- If you want to add signature on ID card then you can draw it or browse from library. 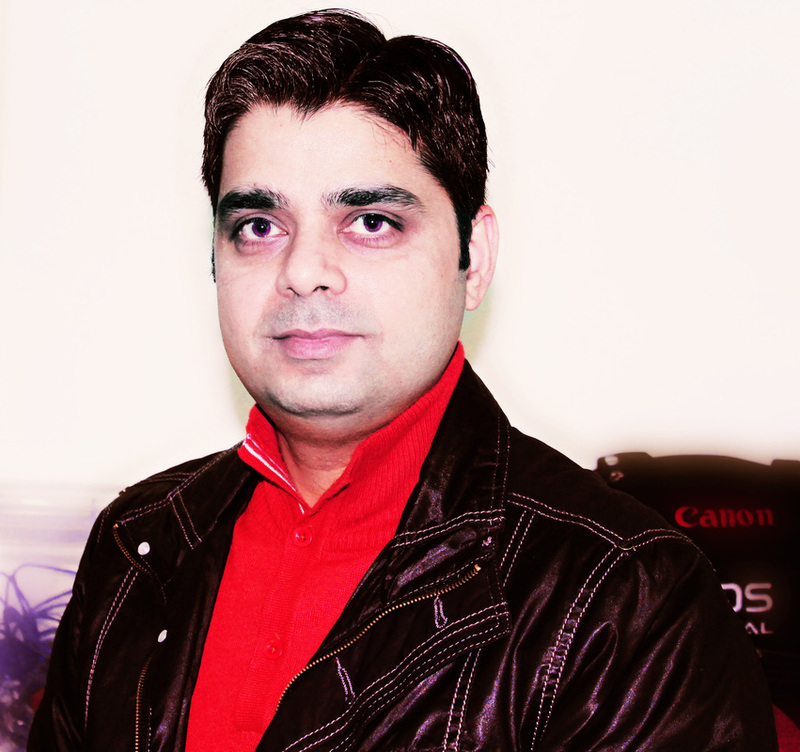 Browse photograph of user from library. Step-4- For printing designed ID card, click on print icon. A new window will open with advance printing settings option. Click on print button. ID card is printing now. 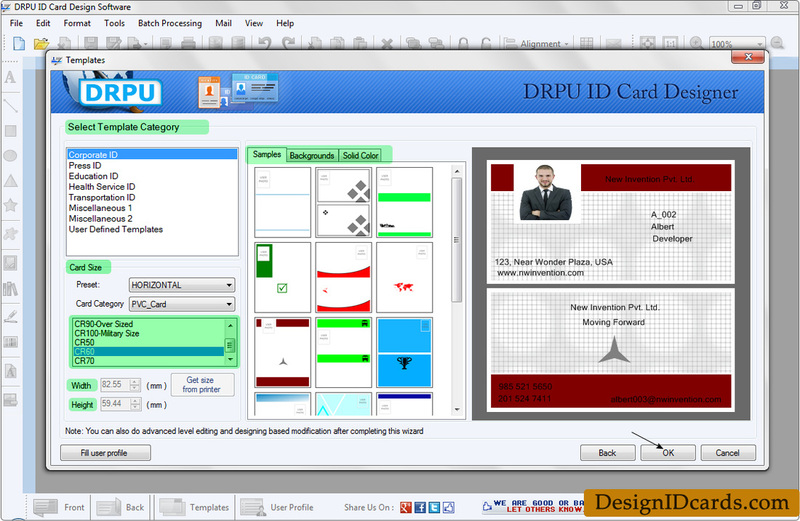 Step-5- Users can trim ID card according to card dimension. For laminating ID card, put it into lamination pouch. Insert it into lamination machine. ID card is laminated now. Users can also punch it using punching pliers or punching machine. Step-6- Ready to use ID cards.